Buying a home is such a complicated process that sometimes it feels like it would take a whole team to get everything done. We know our heroes aren’t afraid to go it alone, but Homes for Heroes is here to be your trusted partner in the home buying process. The benefits of working with Homes for Heroes — both in terms of simplifying the home buying process and saving money with Hero Rewards® — are simply too good to pass up. Let’s look at how Homes for Heroes is elevating the home buying process with qualified specialists working on your behalf who provide heroes with significant Hero Rewards savings. When you choose to search homes for sale and go it alone, it will be up to you to find the homes for sale listings, create a schedule for open houses and communicate with sellers. You can certainly use a real estate agent to aid in your search, but that begins another search to find the right real estate agent. It can be challenging to find a real estate agent you trust who will look out for your best interests, and every minute you spend looking for an agent is a minute you’re not spending looking at houses. Compare that to the Homes for Heroes experience. Our agents are committed to representing heroes. When you sign up with Homes for Heroes, you will be automatically matched with our real estate specialist in your local area. Our real estate specialists can help organize your home search, set up showings and even find you homes before they go on the market. This can speed up your home buying timeline. Our real estate specialists are committed to saving heroes money. They also take time to learn your interests and manage your home search to meet your needs. Getting a mortgage is a major step in the home buying process. You’ll need to figure out not only what type of loan best fits your needs, but also shop around for the best rate. It can be difficult to understand all the complicated language used in the official documents, and comparing rates from different mortgage lenders can slow down your home buying timeline. When you choose Homes for Heroes, you’ll be matched with a mortgage specialist who will work to get you the right loan. Our mortgage specialists are experts at working with VA loans, FHA loans and other loan types. Because our mortgage specialists reduce their lending fees for heroes as part of our Hero Rewards®, you’ll be treated with respect while saving an average of $500 on your mortgage lending fees. Closing day is the last big step in the home buying process. It is full of important financial and legal paperwork to be reviewed and signed. It’s the day where everything you’ve been working toward comes together for your home purchase. If you choose to tackle things on your own, you would manage the closing process, the coordinating of all parties, final negotiations, presentation of all financial and legal paperwork, and necessary final signatures from all parties. Personally, I wouldn’t wish this upon my worst enemy! With Homes for Heroes, you have a partner to the very end. Our real estate and mortgage specialists will be with you on closing day to make sure everything goes according to plan. You’ll also have the opportunity to save money on title fees and home inspection costs. When you close on your new home, Homes for Heroes will send you a check for 0.7 percent of the purchase price. The savings can help you buy new furniture, cover moving costs, pay for renovations or whatever else you need. 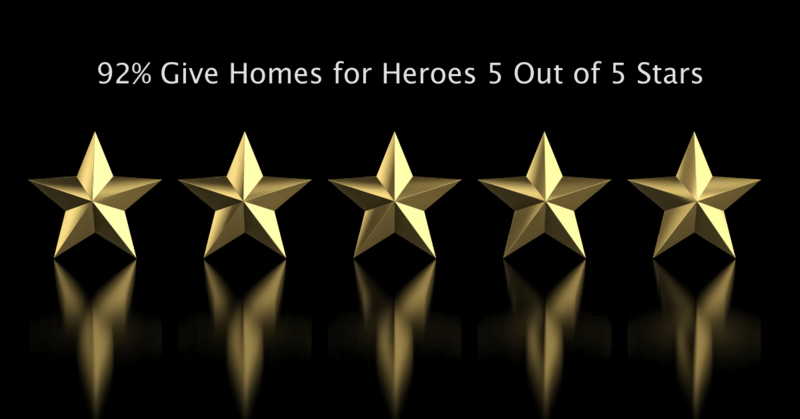 Through the entire home buying process, our heroes save an average of $2,400 in Hero Rewards. Are you looking for a great home buying experience? Sign up with Homes for Heroes and let us save you money on your next home purchase.